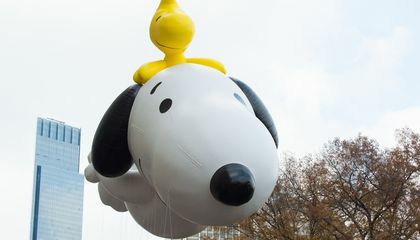 The first Macy's Thanksgiving Day Parade (then known as the Macy's Christmas Parade) was held in 1924. It culminated in front of New York City's Macy's department store. There, elaborate holiday window displays were unveiled. Thousands gathered to see the displays. They were designed by Anthony Frederick Sarg. He was a noted puppeteer and theatrical designer. Sarg was also the mastermind of the parade. During the fourth annual Macy's Christmas Parade in 1927, he introduced the enormous inflatable cartoons and caricatures. They would become almost synonymous with the annual holiday tradition. Creativity was in Sarg's genes. He was born in Germany. His father was an artist. His grandfather was a wood carver. And his grandmother was a painter. They gave the young Sarg a collection of mechanical toys. These may have inspired the imagination of the burgeoning designer. But it wasn't until he saw a performance by famed puppeteer Thomas Holden, who essentially invented the marionette, that Sarg found his calling. He began experimenting with puppet designs and stagings. This was around 1917. He eventually earned fame for his particularly sophisticated puppet shows. These included performances of Faust and Don Quixote. After World War I, Sarg moved to New York City. He gained a reputation as a practical joker and a tireless worker. In his various ventures, the designer, inventor and illustrator worked on cartoons, children's books, mechanical toys, advertising and of course, window displays and balloons. These first parade balloons were filled with oxygen, not helium. They were propped up by teams of puppeteers. These usually were Macy's employees. They were drafted into parade service. 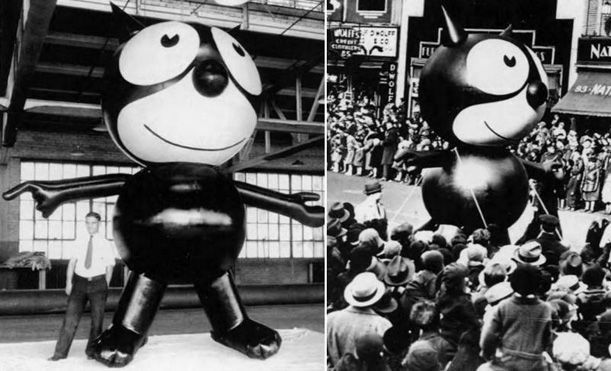 These balloons, such as 1920s biggest cartoon star Felix the Cat, were cruder and smaller than today's Godzilla-like monsters. They charmed and captivated the throngs of onlookers. Other early balloons included a 20-foot-long elephant and a 60-foot-long tiger. There was even an enormous hummingbird. In 1928, the parade culminated with a release of the now-helium-filled balloons. They filled the skies above the city. The stunt was a crowd-pleaser. The following year, the balloons were designed with release valves. These made their ascent easier. Macy's offered rewards for their capture and return. The tradition continued until 1932. That is when a daredevil pilot thought it would be fun to capture the balloons with her biplane. She nearly crashed. The rubberized canvas wrapped itself around the plane's wing. The rubberized silk balloons were produced by the Goodyear Tire & Rubber Company in Akron, Ohio. Their archives at the University of Akron include some amazing pictures of these early behemoths. Why aren't these kinds of balloons used in all parades? These balloons are always in the parade because everyone likes the big balloons. These balloons are always in the parade because everyone likes the big balloons and they would never get rid of the big balloons. I thought they were made with the parade. They use these balloons in parades because,it been held in 1924 so that means it been around for a long time. these balloons aren't used in all parades because they pro ply don't war to make those for every parade because the one that makes the balloons they would get tired of making all of those big balloons. The balloons aren't used in all parades because it would get boring so after a while people would not go to them. These kinds of balloons are not used in all parades because, maybe they are too big. Or maybe big things like that are not allowed in some towns and city's. The last reason I've got is maybe people do not want to hold them up or volunteer.